The Education Department and congressional Republicans are proposing a new program that would provide up to $5 billion every year in federal tax credits for contributions to groups that give scholarships for children to attend other, typically private, schools. 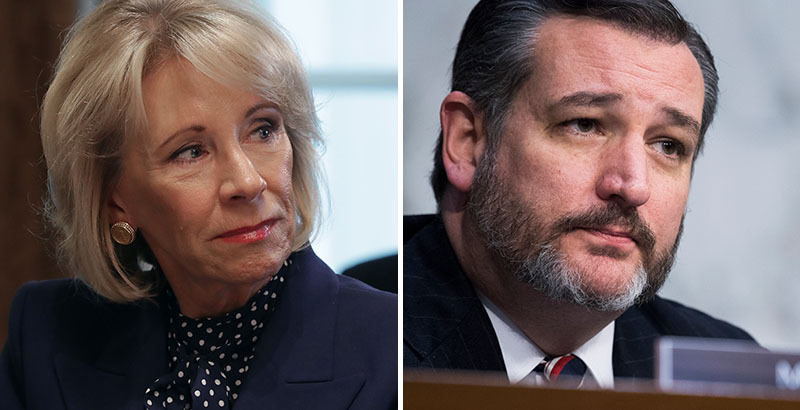 Education Secretary Betsy DeVos, with Sen. Ted Cruz of Texas and Rep. Bradley Byrne of Alabama, will unveil the program at a press conference Thursday morning at the department’s offices in Washington. Cruz and Byrne, both Republicans, will introduce necessary legislation in the coming days, according to a senior Education Department official. Tax-credit scholarship programs exist in 18 states. Some states have more than one program, and each has its own rules, but they are commonly set up for the benefit of low-income children or students with disabilities. Taxpayers can, in some instances, claim part of those donations as charitable contributions on their federal taxes. The difference under this proposal is that the federal tax benefit would be a credit — a dollar-for-dollar reduction of an overall tax bill — versus a deduction that lowers the taxpayer’s overall taxable income. While the bill wouldn’t mandate the type of scholarships covered, in early conversations, staff have discussed scholarships for apprenticeships, advanced or remedial courses, and concurrent and dual enrollment programs, the official said. “This is an opportunity for states to take advantage of scholarship money that would be made available to them for programs that they design,” the senior Education Department said in a background call with reporters Wednesday evening. A federal tax-credit scholarship program was discussed, at least in think tanks, but not included during the 2017 tax reform debate when Republicans controlled Congress. Chances of passage for a new private school choice program through the House, now under Democratic control, are next to zero. Some of the most conservative advocacy groups have also expressed concerns about a hypothetical federal tax-credit scholarship program as overstepping the Constitution, which they say allows for limited or no role in K-12 education, and an opening for more federal regulations of private schools in future presidential administrations. Under the bill, the specifics of each state’s program — including the amount of each scholarship, which students may apply, and whether participating students would have to take the same standardized tests required of public school students — would be up to each state. “We are in favor of school choice, and so we’re not even going to tell states how they provide those choices,” the Education Department official told reporters. Individuals would be eligible for a tax credit of up to 10 percent of their adjusted gross income, and businesses of up to 5 percent of their net taxable income. Taxpayers could donate to tax-credit scholarship programs anywhere in the country. They wouldn’t receive both a federal tax credit and a state tax credit for the same dollar. So a taxpayer who gives $1,000 in a state with a 70 percent credit could take $700 off their state taxes and $300 off their federal taxes, subject to the other limitations. The $5 billion national cap would be divided up among the states based on their current Title II grant allocation, which funds teacher and principal training. Those grants are based 80 percent on each state’s percentage of students living in poverty and 20 percent on its overall student population.